The images in this posting are reproductions of the actual training brochure. “Out-of-Control: A Dialectical Behavior Therapy (DBT) – Cognitive-Behavioral Therapy (CBT) Workbook for Getting Control of Our Emotions and Emotion-Driven Behavior” Recovery Works Publications (2009). Participants will gain familiarity with the DBT-CBT recovery program including the types of problems and issues it addresses, the treatment groups it best serves, and its use in a variety of treatment settings. Participants will gain an understanding of the dynamics of the three mind states (Emotional Mind, Rational Mind, and Wise Mind) and their role in relapse and recovery. 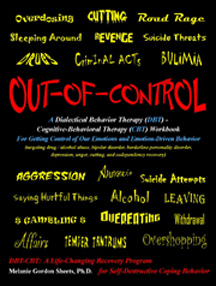 Participants will gain familiarity with the use and application of key DBT-CBT worksheets (The Big Picture of My Life, Challenging Negative Judgments of Me, Mindfully Protecting My Peace and Stability, The Cycle of Suffering in My Life, The Well Analogy, The Wise Mind Worksheet, and The Game Plan). Participants will gain skills for using Rational Mind to challenge the irrational thoughts of Emotional Mind (Emotion-Driven Thoughts) and to talk individuals through urges to respond to emotional situations in destructive ways (Emotion-Driven Behaviors) to facilitate Wise Mind problem-solving and life-enhancing coping behaviors.